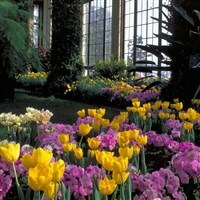 Longwood Gardens in Kennet Square, Pennsylvania is one of the premier horticulture display gardens in the United States. Longwood Gardens is an American botanical garden. It consists of over 1,077 acres of gardens, woodlands, and meadows in Kennett Square, PA in the Brandywine Creek Valley. Enjoy the day exploring the gardens, woodlands and meadows and bask in the beauty around you. There is a self-service cafeteria where you may purchase your lunch. Be sure to visit the gift shop before we depart. Dress for the outdoors, this tour is rain or shine.